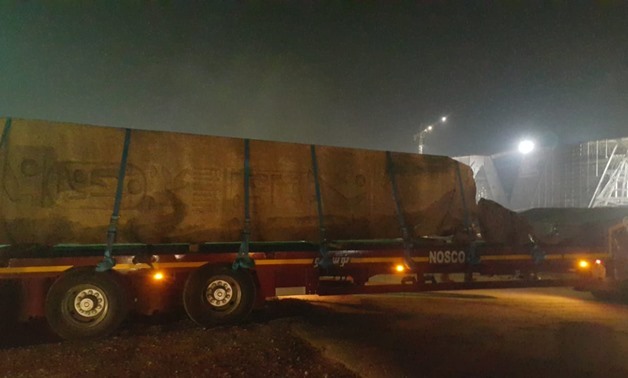 CAIRO – 12 September 2018: The Grand Egyptian Museum (GEM) received on Wednesday morning 11 granite pieces, which are parts of three obelisks found in San al-Hagar archaeological site in Sharqiya governorate. Previously, the Ministry of Antiquities declared that the archaeological mission at San al-Hagar finished restoring and compiling one of King Ramses II's statues at the site as part of the development project at San Al-Hagar site to develop it into an open-air museum. A stela of 19th Dynasty King Ramses II was discovered in January 2018 by an Egyptian mission during working at San Al-Hagar site. Furthermore, during excavations at San El-Hagar archaeological site, the mission found parts of a huge red brick building, probably parts of a bath dating back to the Greco-Roman era. The mission also found pottery vessels, terracotta statues, bronze tools, a stone fragment with engraved hieroglyphs and a small statue of a ram at the archaeological site. Mostafa el-Waziri, secretary-general of the Supreme Council of Antiquities, announced that the stela is carved in red granite and depicts King Ramses II presenting offerings to an ancient Egyptian deity. He recounted that although several foreign missions have worked on San Al-Hagar archaeological site, it has never been extensively excavated and has been neglected for some time. "This neglect pushed the Egyptian mission and the Ministry of Antiquities to establish a comprehensive development project at the site to protect its monuments and convert it into an open-air museum," Waziri added. San Al-Hagar is a prominent archaeological site that houses a wide collection of temples, among which are temples tailor-made to the goddess Mut, the god Horus and the god Amun. Several foreign missions previously worked at San Al-Hagar because of its archeological importance. Waadalla Abul Ela, head of the ministry's projects sector, announced that a development project targets to establish a collection of concrete mastabas for the monumental blocks and stelae that were found in the temple.